Ruby Berlin e.V. is an umbrella organisation hosting and supporting events around the Ruby programming language in Germany. At 31C3 we want to gather Rails Girls, local user groups as well as all individuals interested in Ruby at an assembly and create a welcoming home base to hang around, hack on projects and get to know other Rubyists. Python, Django, The (un)employed schemers & lispers guild, Teckids e.V. We will bring two stand-up displays for Ruby Berlin e.V. and the Rails Girls Events. Some of us will probably bring small coffee machines / water boilers. 2. We'd like to come together with a lot of people, a spot with lot's of people passing by and good visibility would be nice. [[Has planning notes::We'd like a place in the "Foyer"  of CCH – somewhere around the place last years Python assembly was located. We will probably bring a projector screen. So a place near a wall or next to a post would be great, so we don't block too much sight. 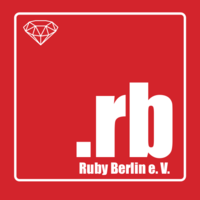 We're Ruby Berlin e.V. – an organisation hosting and supporting events around the Ruby programming language in Germany. At 31C3 we want to gather Rails Girls, local user groups as well as all individuals interested in Ruby at an assembly and create a welcoming home base to hang around, hack on projects and get to know other Rubyists. We set up a IRC channel #rubytown on chat.freenode.net. This page was last modified on 23 December 2014, at 12:19.